Beautiful two bedroom home, with mountain views, satellite TV, private pool, DSL high-speed internet and all the amenities needed to enjoy your time in Costa Rica. 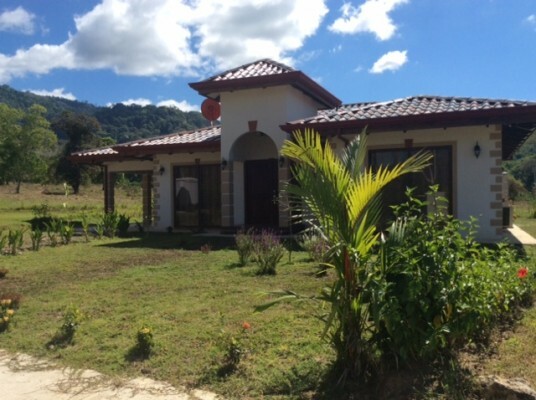 This is a beautiful mountain view vacation villa for rent in Costa Rica featuring 2 bedrooms and 3 bathrooms. Stay here and you’ll have a wonderful time! Awaken to the sounds of howler monkeys and toucans. Enjoy the ever changing landscape and shadows that dance on the mountains to the north, east and south. Savor the amazingly beautiful sunsets that our gated community has to offer. The villa is equipped with all the amenities you come to expect from a vacation villa through Las Villas de San Buenas. Across the street (private road) from our “Owners Only” rancho and BBQ/grill. As with all Vacation Villas and homes in Las Villas de San Buenas, customers and owners are close to all of the amenities that the Osa region has to offer. Let us help you plan your vacation and all of the nearby activities. The full moon resting above our rancho.